Whilst the Watagans State Forest Road is easy going, the track (Daniels Rd)leading off it require a more experienced driver, for example Daniels Road, you\'ll require a heavy duty off road vehicle as this road leads down a river. I have not reached down that far, however, we passed a few high lifted vehicle that didn\'t recommend it, even with their jacked up cars. When I did this track it had been raining, so I dare say that is probably the reason. Prickly Ridge Road - due to the recent rains (between January and April) this road has eroded considerabley since travelling on it in December 2007, hence making it a little interesting. You can still drive on it with a SUV. The road has soft edges and at places narrow strips where water has eroded it. 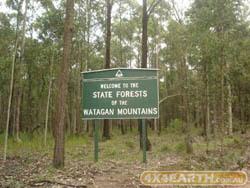 Did the Watagans on the 27/08/11, It had been raining for a week before. The main tracks are all good, but Old Mill Rd has a approx 5ft hole/drop off at the bottom of the gully, with no way around it, no way a standard 4WD could get past it, a high lift truck may make it . Prickly Ridge Rd is now just a mud pit and getting worse....Didn\'t see the road closed sign until we were at the bottom of the road/track.